Duval Portraits, East 15 Walton Avenue, Spokane, Washington. Photo taken 22 January 1954. Estelle Duval at the front desk of Duval Portraits. Photo taken 1 April 1954. The stairs lead to the door into my great grandparents residence. Several of the photos on display are of family members. The bridal photo in the window is my grandma, the man in Coast Guard uniform to the right of Estelle’s head is my grand uncle Frank, the toddler photo hanging to the left of the door is my uncle Craig, the bride to the right of the door is my grandma. There are a few others that look like siblings of Estelle but I’m not positive. 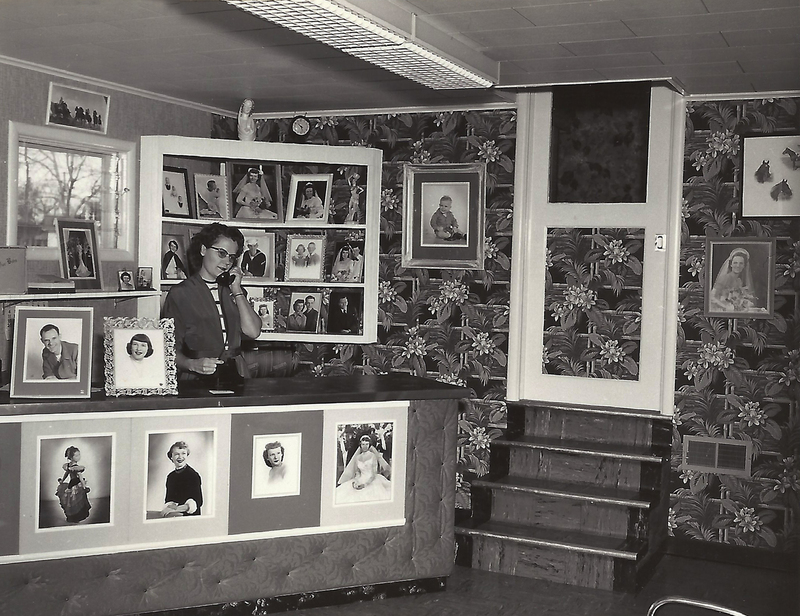 This is an interior shot of the Portrait Studio/Bead Shop taken in 1970. The dress, bag and headband on the mannequin were made by Estelle for her granddaughter, my Aunt Vicki. My grandma later wore this when she married my grandpa Jack. As you look at the details in this photo you can see the blending of the Portrait Studio and Bead Shop. Above the shelf on the left are some Native American artifacts. There are frames for sale just below the artifacts. There are leather moccasins waiting to be beaded just below the frames. In the back room I can see a few more artifacts, baskets and boxes of beads. On the right side of the photo there is a wall hanging with pink fringe that can be seen from the back. I don’t recognize this item but I would guess that it has bead work on the front. For my 52 Ancestors post this week I wanted to highlight a place instead a of a person. The reason I want to share this place is that it became an integral part of my family for many decades. It blessed four generations of my family in different ways. The place is the studio in front of my great grandparent’s home. The address is E 15 Walton Avenue in Spokane, Washington. My great grandparents ran their photography studio known as Duval Portraits from their home for several decades. During that time they photographed lots of people including many of the local Native Americans. My great grandmother developed personal relationships with several of the Native American women she photographed. She began to bead with them in her photo studio. Because it was difficult to purchase cut glass beads in the colors and quantities she wanted, she started ordering them in bulk using her wholesale license from the photography studio. She ordered beads from New York for a while and then Czechoslovakia. Slowly her studio became a dual business. She still took photos but she also sold beads. Over time she steadily raised her prices in the photography studio in an effort to phase it out but people were willing to pay the rising prices for her work so Duval Portraits lived on. 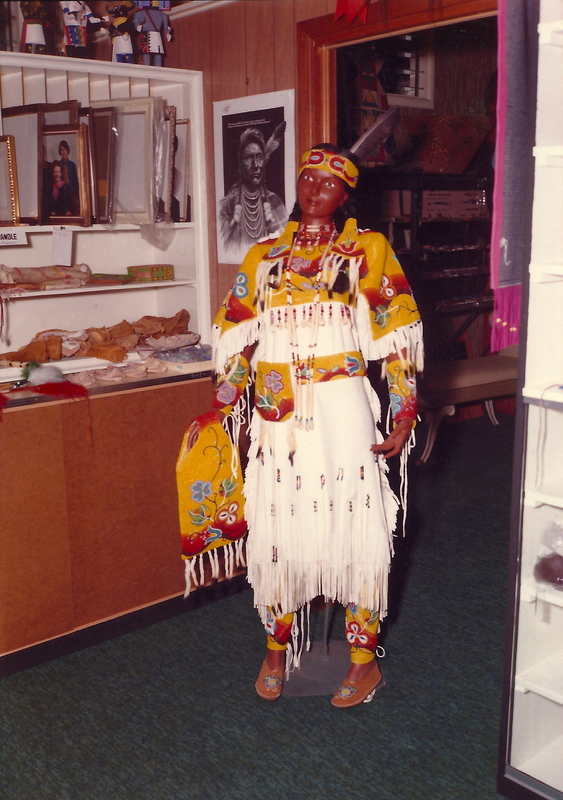 She was never able to completely phase out the portraiture but she did expand the bead selections and even converted part of the studio into a museum to display Native American artifacts that she acquired. She created some amazing beaded items. Several of those items are still owned by various family members today. On my recent trip to Spokane I was able to photograph several of these treasures and my grandmother gave me two beaded items. One item that my great grandmother created and used personally and one that was part of the shop. I’ll post about each of these treasures individually in the future. My great grandparents were such fascinating people. They had so many talents and interests. They tried their hand at several different jobs and businesses. Because the bead store still operated during my early childhood and I was given beaded moccasins when I was young, I find this part of their life especially interesting. I have several memories of the home on Walton and the studio. I believe that places from our past are almost as important as the people who lived, worked, and loved in those places. When I visit places that my ancestors lived and worked I feel connected to them. Places have the power to evoke memory. The studio is one of those places for me. Do you have any places from your family history that are special to you? I loved this! I also have a place that is so special to my family. It’s my grandma’s house which has been in our family for SIX GENERATIONS!! I am sure my grandma will pass the house on to the next family member, and I hope it keeps going. It’s such a special place that our family has filled since the 1850s! That is AMAZING! Where is your grandma’s home? I can’t believe it’s been in your family for so long – love it! Oh! I will, thanks for sharing the link!! You’re fortunate to have a professional photographer in the family – all of those well documented family members. I just wrote about my hometown and how I didn’t realize growing up that my family was deeply embedded in the history of the town. I’m currently working on a post about my grandaunt who ran the florist shop in town from 1929 to her death in 1975. The shop is still there, although it’s no longer owned by family. I hope to visit it the next time I’m in town. I often think about how wonderful it is that my great grandparents were photographers. I hear many people wishing they had a photo or two and I have hundreds of lovely, high quality photographs. My great grandma – a different one – was also a florist. Where was your Aunt’s floral shop? Yes, I’m rather jealous of those photos. Not to mention the direct ties to the local Native American culture. So interesting! My great aunt ran the flower shop In my hometown: Flushing, Michigan. I just dug up a picture of her and her husband outside their shop. I’ll post it soon. Both of my great grandparents were French-Canadian so they very likely have a fair amount of Native American blood. There are several whispers, rumors, and half-stories about his part of our heritage. It hasn’t been identified and my never be but it caused a great interest in all things Native American for several generations of my family. Pretty interesting stuff. Fantastic! I wish I lived anywhere near where my ancestors were from. Sadly most of my family seemed to move around so much that not many places seem to have a lasting significance, but I do love going through the places my ancestors were from and feeling a certain sense of belonging. I do like going past places I know they lived and feeling a connection. I also love to feel that connection that comes from visiting places I’ve never been but that my ancestors have. A lot of my family moved around too, so I understand some of what you are talking about. I enjoyed reading this post. Photography and beads. . . what an interesting combination for a business, but it sure sounds like they complemented each other to make a great business for your great-grandparents. Thank you. I agree- unusual combo but it did work well for them. What a terrific collection of photos. 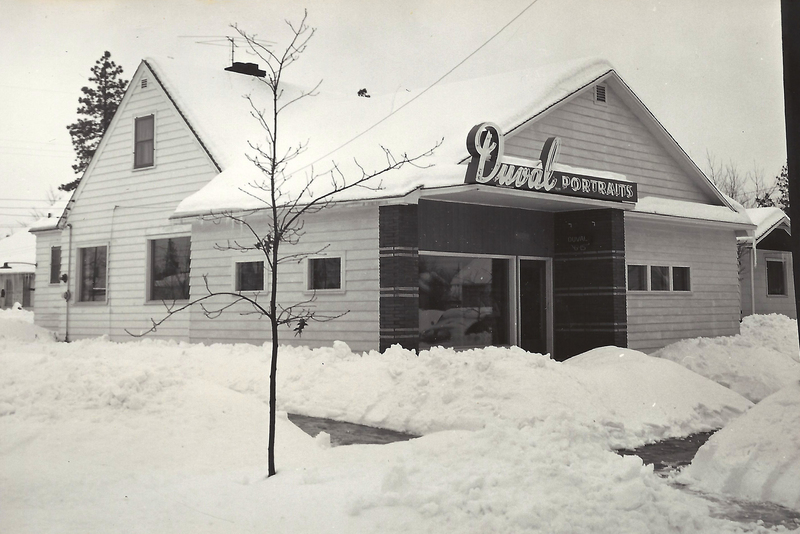 I really could feel the small town atmosphere in the early 1950s photos of Duval Studios. You are correct in saying we can connect to our ancestors by visiting the places they lived or worked. It brings the past to life so intimately. The house on Walton was my favorite place as a kid. My best childhood memories happened here. Whether it was Christmas, 4th of July or just a summer day, the magic happened at Grandma and Grandpa Duval’s. The house itself was fascinating. Grandpa had build the studio addition and made many other improvements. There were hidden safes, compartments and doors. I loved to explore here. He had cut a small doorway in his closet and then puddied and painted it so it was almost undetectable. This was Grandma and Grandpa’s escape route if there should be a fire. He would kick out the panel and they would go through the wall to the outside. (his home burned when he was a child). He also had a secret compartment in the bathroom that he had build into the cabinet. He could hid a gun or various other things here. I found the compartment when I was little. Grandpa told me that he had built a secret compartment somewhere by the studio and he challenged me to find it. It took me all day to find that the face of the bottom step going to the studio unscrewed and behind it was the hiding place. Very cool. The house is a rental now and is slated to be torn down sometime, but for now it still stands, still full of the best memories for me. I love all these details! Thank you for taking the time to share those sweet memories Heather!